The leg contains the motor and lifting column for your UPLIFT Desk. 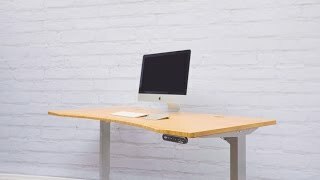 If you need a replacement for any of these components for any two or three leg UPLIFT 900 Series Sit-Stand Desk, you can order a new desk leg in black, white, or gray. Note that if you are adding a third leg to a two leg desk, you need to purchase the UPLIFT 2-Leg to 3-Leg Conversion Kit. The UPLIFT Desk Replacement Leg comes in your choice of black, gray or white to match your UPLIFT 2-Leg Desk Frame or UPLIFT 3-Leg Desk Frame. $180.00 List Price: $250.00* The list price is the same as the MSRP (Manufacturer's Suggested Retail Price). It may not necessarily be the price at which the product is sold.